Historical places have a unique charm of their own. They not only provide a glimpse into the rich historical past, but they also represent the great achievements made in art and architecture. And the best part is that there is no dearth of such places in India. In fact, no matter what part of the country you go to, you will find a city that boasts several interesting historical places. One such city that is famous for its historical places is Hyderabad. 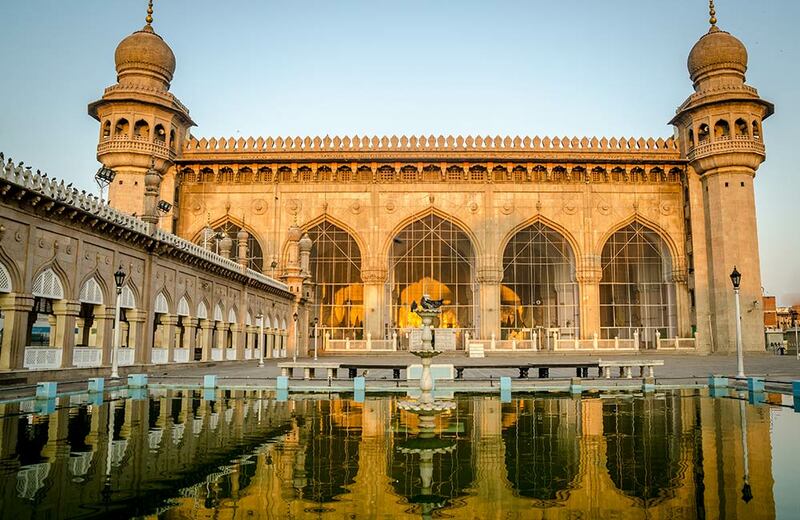 Popularly referred to as the ‘City of Nizams’, Hyderabad has a rich historical legacy and is replete with historical places that provide magnificent memories of the bygone era. 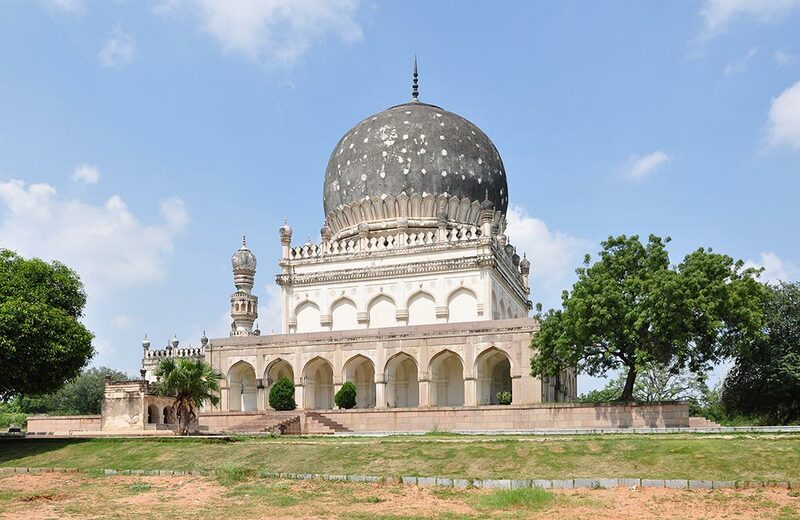 That said, in this post, we list some of the most popular historical monuments in Hyderabad that give you a reason to visit the city. Formerly known as Mankal, Golconda fort was built by Kakatiya Kings and completed by Rani Rudrama and her successor Prataparudra. However, the structure that we see today was renovated by the Sultan Quli Qutb-ul-Mulk from Qutb Shahi dynasty, who chose Golconda to be the center of his governance. 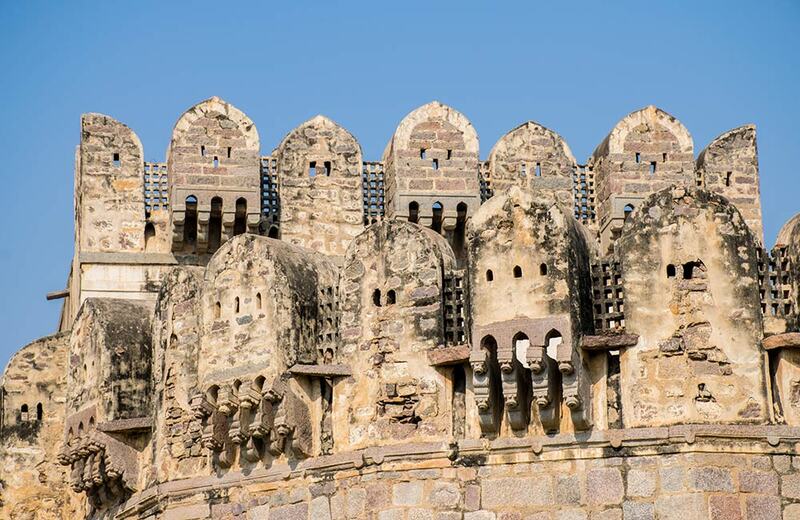 The fort is an engineering marvel and is considered one of the best Hyderabad tourist places. A hand clap at a certain place below the entrance of the dome of Fateh Darwaza echoes and can be heard at Bala Hissar pavilion, which is the highest point of the fort and is almost a kilometer away! Also, the fort has eight gateways, several temples, mosques, stables, royal chambers, and four moveable bridges. The magnificent fort is built on a granite hill and once stored the world-famous Koh-i-Noor, Hope diamond, and Daria-i-Noor. It overlooks the city and is a must visit place for magnificent architecture and historical significance. The Four Minarets, also known as Charminar, is another monument built by the Qutb Shahi dynasty. There are many folklores about the true origin of this building with some suggesting that the structure was built to mark the end of an extremely deadly Cholera. There’s another interesting tale that Charminar was the spot where Qutb Shahi got the first glimpse of his future queen to be Rani Bhagmati. Charminar is a square structure made of granite, pulverized marble, mortar and limestone and is known for its balustrades, balconies and stucco decorations. The four minarets that are 56-meters tall stand at each corner of the main structure. Each minaret has a double balcony, and there are 149 steps to reach the upper floor. There is a mosque on the top floor of the four-storied Charminar. 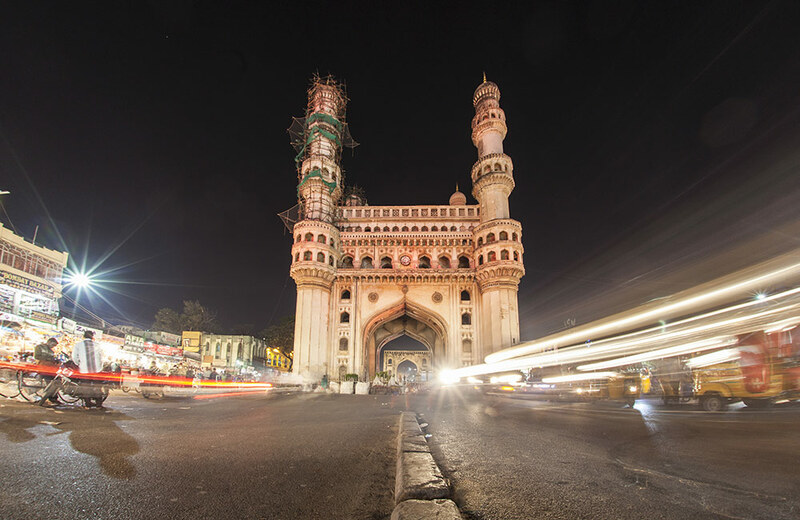 It is said that an underground tunnel that was built to help kings and queens escape during an enemy attack connects Charminar with Golconda fort. One of the oldest monuments in the city, Qutub Shahi Tombs were built by Sultan Quli. 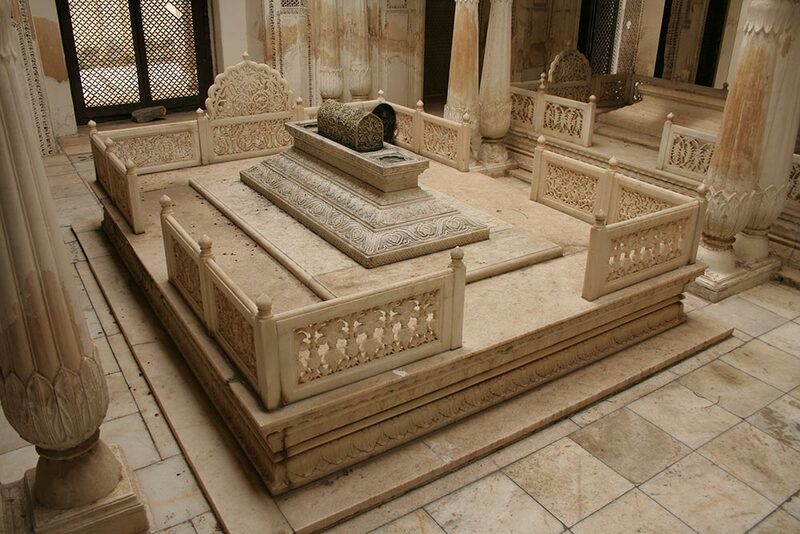 The tombs are located in Ibrahim Bagh and are approximately 850 meters away from Banjara Darwaza of Golconda fort. These complexes are either one story or two storied and have mosques and tombs of kings of Qutub Shahi Dynasty. What’s interesting is that an inscribed sarcophagus covers the actual burial vault at the center of each tomb. The domes originally had beautiful blue-green tile work, but only a few pieces remain as evidence to this fact. The structure of the tombs is influenced by Persian, Pathan, Deccan and Hindu styles. 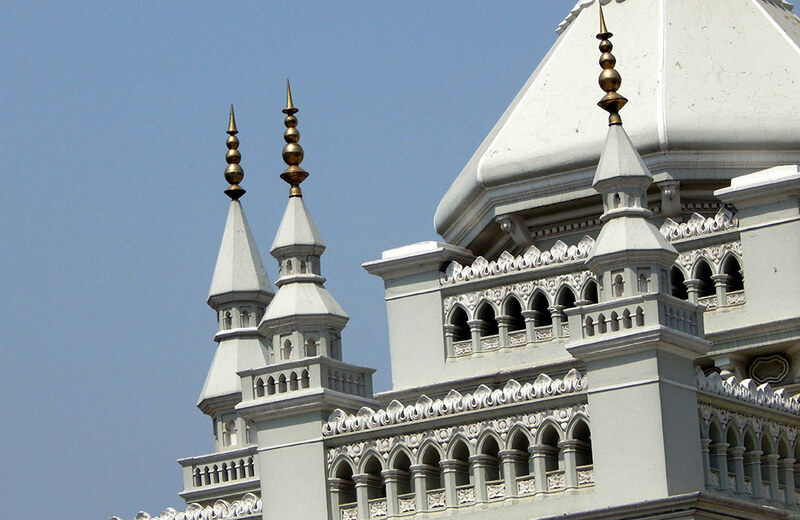 With the capacity of hosting 10,000 people, Makkah Masjid is the largest mosque in India. It was built in the 17th century and takes the name from the Grand Mosque of Mecca. The bricks used in the central archway of the structure are made from the soil sourced from Mecca. It is said that around 8000 masons worked round the clock to complete the construction in 77 years. The three fascinating and exquisitely designed facades are carved out of a single granite stone which took the large team of workers five years to quarry. This structure was comprehensively designed and has floral motifs and friezes with cornices running around the entire mosque’s complex. The courtyard entrance is home to the Asaf Jah ruler’s marble gravesite. Built in the 18th century, Chowmahalla Palace was the center of governance for the Asaf Jahi dynasty and later served as the residence for the Nizams of Hyderabad. All the ceremonial functions were held at the palace. The vast structure has two courtyards, a grand darbar hall called Khilwat along with fountains, and gardens covering 12 acres of land. The Southern courtyard is the oldest part of the palace and has four smaller palaces Afzal Mahal, Aftab Mahal, Tahniyat Mahal, and Mahtab Mahal. The Northern courtyard, which once housed the administrative wing and Shishe-Alat, has a long corridor with rooms facing the central fountain and pool. It is an impressive structure with ornate stucco work, and the darbar hall has a marble platform that once used to be the royal seat. Heaven for art lovers, Salar Jung Museum, is one of the largest museums in the world and one of the three National museums in India. It boasts of items collected from Japan, France, Germany, Nepal, China, Burma, Persia, Egypt, Europe, and North America. The museum has carvings, sculptures, textiles, paintings, clocks, carpets, weaponry, manuscripts, ceramics, furniture, and scriptures. There are a total of 38 galleries – 20 galleries on the ground floor and 18 on the first floor. Every subject has been displayed in a separate space. Some of the notable items on display are Aurangzeb’s sword, Veiled Rebecca by Giovanni Benzoni, Quran written with Gold and silver, Tipu Sultan’s wardrobe, Seated Lady by M F Hussain and many more. 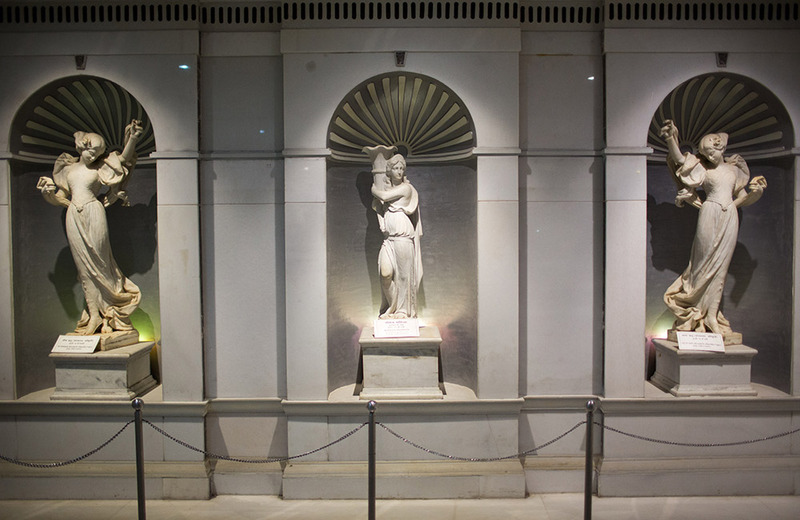 The museum is named after the artifact collector Salar Jung Family. Situated on a hilltop, Taramati Baradari is believed to be built in honor of Abdullah Qutb Shah’s favorite courtesan Taramati. It is a Persian-style constructed garden and a historical Sarai having 12 doorways. It was considered an engineering genius because the doors allowed cross ventilation, which was something unique at that point in time. Many stories suggest that the structure was built so that Abdullah Qutb Shah could hear the enchanting voice as Taramati sang for the travelers staying at the Sarai, while another tale hints that two dancing sisters, Taramati and Premamati would dance on the ropes tied between the balcony of the king and the Sarai. 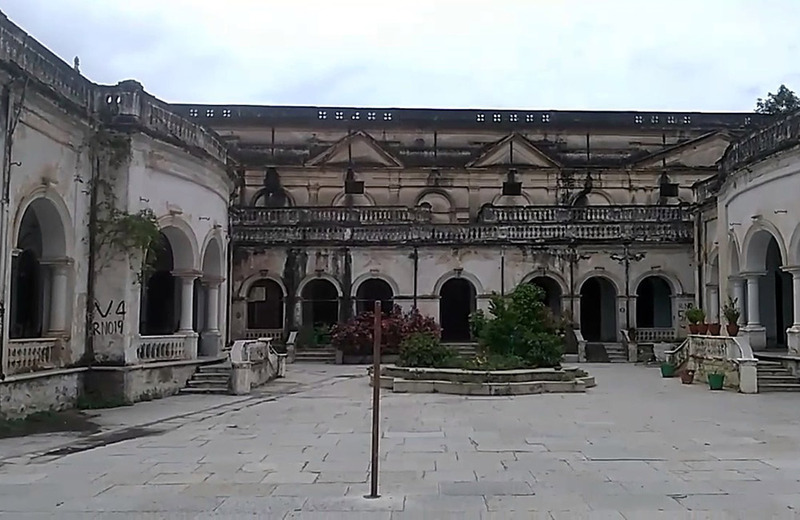 Taramati Baradari has excellent acoustics, and because Taramati dedicated her life to dance and music, several classical music and dance performances are held at the palace. There’s a large open theater in the complex with the capacity of 1600 people. 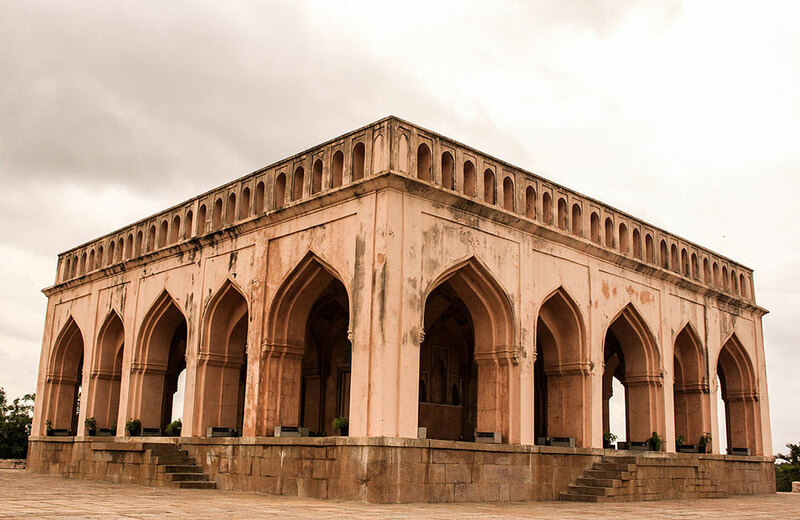 Also known as Damri Masjid, Toli Masjid is only 2km from the Golconda Fort. Based on the folklore Mir Musa Khan, the royal architect, was given one damri (an old Indian currency) for every rupee spent on building Mecca Masjid, with which he made the Toli Masjid. This beautiful mosque is built on a raised platform and has two halls. There are two large minarets, six small minarets, and five beautiful arches embellished with lotus medallions. The masjid ranks after the Mecca Masjid on the architectural scale and was declared a heritage site by the Archaeological Survey of India. Spread across an area of 30-40 acres, Paigah Tombs are a marvelous piece of artistry on marble. These tombs belong to the noble families of Paigah who were loyal to Nizams and served as state’s people and generals. The tombs are a major architectural attraction due to the excellent craftsmanship, beautifully inlaid marble carvings and mosaic tile work. The ornamental-carved screens and canopies, embellished floral motifs on marble and stunning stucco work have the influence of Mughal, Persian, Rajputana, and Asaf Jahi architecture. Each tomb has a unique design; an abundance of latticework and geometric pattern is one-of-a-kind which cannot be found anywhere else in the world. This beautiful mosque in Hyderabad is also called the Mosque of the Moors because of the Moorish style of architecture that is not found anywhere else in India. The construction of the mosque started under the orders of Vikar-ul-Umra, Iqbal ud Dowla, under the rule of Nizam Mir Mahbub Ali Khan Bahadur. 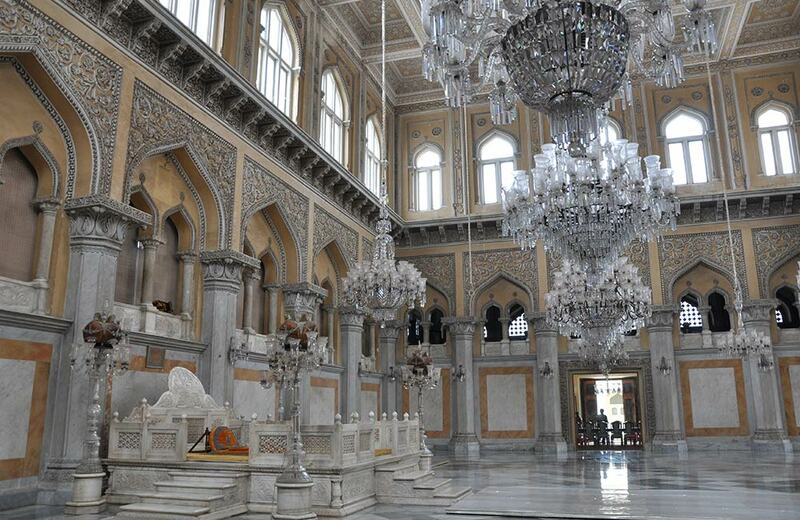 The construction was completed by his elder son Nawab Sultan Ul Mulk Bahadur. 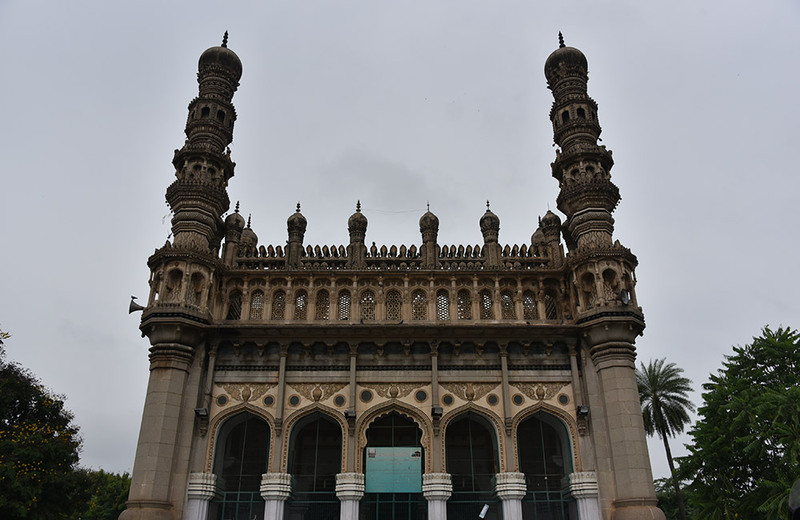 This masjid has two other names Masjid Iqbal Ud Daula and Aiwan-E-Begumpet. The design of the mosque is inspired by the Cathedral-Mosque of Córdoba in Spain. It has Quranic verses engraved on the walls. The most interesting feature is the spires instead of the usual circular domes that give the mosque a church-like appearance. Standing tall on a 2000-foot high hill, Falaknuma Palace meaning “Mirror of the Sky”, was built by Nawab Sir Vikar-ul-Umra. 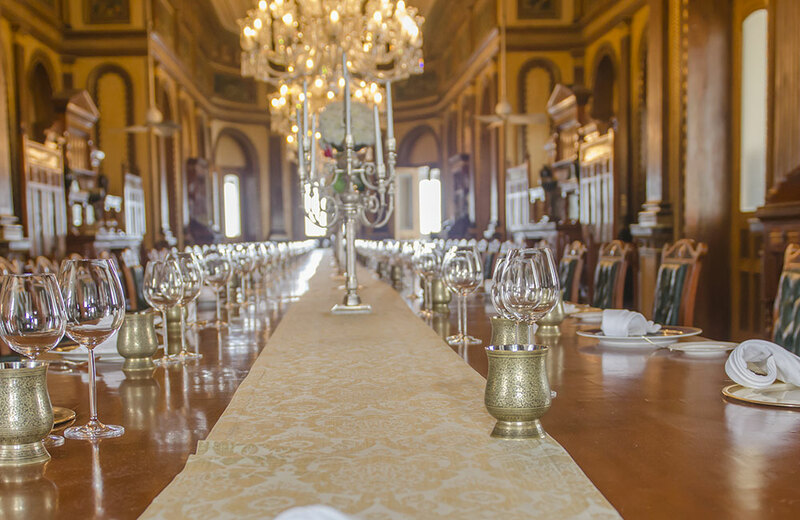 The palace spreads across 32 acres of land and was constructed with Italian marble. Though the construction started in 1884, it took almost 9 years to complete the structure. Built in the shape of a scorpion, the palace has 220 rooms and 22 halls. The stained-glass windows, frescoes-decorated ceilings, magnificent Jade collection, Venetian chandeliers and statues, and paintings give a peek into the luxurious life of Nizams. The library has an elegantly carved walnut roof which is an exact copy of the one in Windsor Castle. Another fascinating fact about the palace is that Burroughs and Watts from England created two indistinguishable billiards tables, with one kept in Buckingham Palace and the other in the billiards rooms of this palace. Also known as Haveli Khadeem, Purani Haveli was the official residence of the Nizams. The palace has a 240-foot long wooden chamber with 150 walk-in closets, which makes it the world’s largest wardrobe. It is a U-shaped complex housing a single-storied building at the center that is influenced by European architecture. The Haveli has a museum that consists of the marvelous collection of keepsakes, presents, souvenirs, miniatures presented to Mir Mehboob Ali Khan, sixth Nizam of Hyderabad. Some of the notable items are gold tiffin box completed with diamonds, gold and diamond studded daggers, pearl-studded wooden writing box, painting of Mir Osman Ali Khan, silver perfume containers, silver coffee cups studded with diamonds, and several silver filigree elephants. Besides visiting the above mentioned historical places, there are a lot of other interesting things to do in Hyderabad. For instance, if you are a ghost hunter then you can go check out the haunted places in Hyderabad or hangout places in Hyderabad. Similarly, if you aren’t too big a fan of paranormal things and are visiting the city with your family, then you can visit the water parks in Hyderabad. So, if you want to see the best of the city, we suggest you step out of your hotel in Hyderabad and start exploring.